My thoughts have been distracted from fashion over the last few days. We are currently renovating our house while living in situ. This means my thoughts revolve around renovations and refurbishments of my home rather than any self-decoration! My evenings, post dust-busting, are spent flicking through sites searching for inspiration and trying to remember where and when I might have seen that elusive something I thought that was cool. My gorgeous street in Paris, Rue du Poitou, offered me two delights when I first stumbled upon it a few years ago. One was the little gem, L’Hôtel du Petit Moulin, the other was The Collection, a gorgeous little boutique showcasing the home design pieces of a select group of creatives. I was directed there as I fell completely in love with the wallpapers in the aforementioned hotel. They were stocked in The Collection and were by Deborah Bowness; I’ve coveted them ever since. 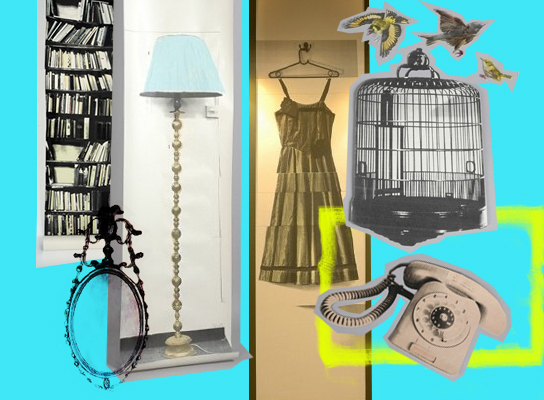 Now, as we recreate our home, some surfaces worthy of Deborah’s designs have started to emerge. I’ve seen her bookcase designs in several places, every time feeling envious and desperate to rip a little piece off (I of course wouldn’t!) Now we’re left with the dilemma of which pieces to chose and where to put them. Take a look at Deborah’s website for yourself and let me know which one’s you’d choose and why. I shall keep you up to speed on our project. So far there are no walls on the upper floor…and we may keep it that way! A short but hopefully sweet post to begin. 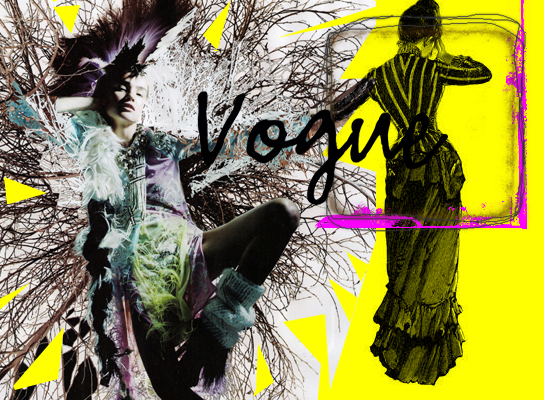 Natalia Vodianova’s editorial in February’s British Vogue blows me away. Not least because I had the good fortune to be able to watch Nick Knight’s shoot live at the Fashion Revolution exhibition at Somerset House but simply because it’s visually quite overwhelming (in a good way!) The SHOWStudio blog documented every inch of Nick’s progress at the live shoots but you can see some of my own photos on my Flickr account too. Today I was forced to ask myself the question, is anything actually original anymore? Trends, seasons, styles, transcend the decades and eventually come full circle with a contemporary spin. The reason I was forced to face this myself – A genuinely lovely fellow human being that I met & showed my blog has created something extremely “similar” herself. At first I thought the comparisons were all in my mind, me being prissy & egotistical over my work. Then, others started to email me having noticed the similarities. Should I be outraged? Should I be offended…or should I just feel flattered that this person was inspired by me? It’s a tough one. I do not own the copywrite to my collages, I cannot stop anyone rewriting what I have already written but is there a metaphorical ethical line that shouldn’t be crossed? Somewhere along the line, someone else’s work must have influenced me to take the creative path I have taken. ASOS & Topshop have both come under fire on Twitter this week for being very “inspired” by other’s work. Both were guilty of producing accessory pieces that were extremely similar, boardering on identitical, to the original designer’s pieces. I then had to ask myself where the line is drawn on similarities to catwalk pieces. In an industry where the turn around from catwalk to high street is becoming ever rapider, do the designers take umbridge? Did the creative team at Balmain bombard Zara with emails of complaint at the production of their sequined shouldered blazers? I think therein may lie the difference. 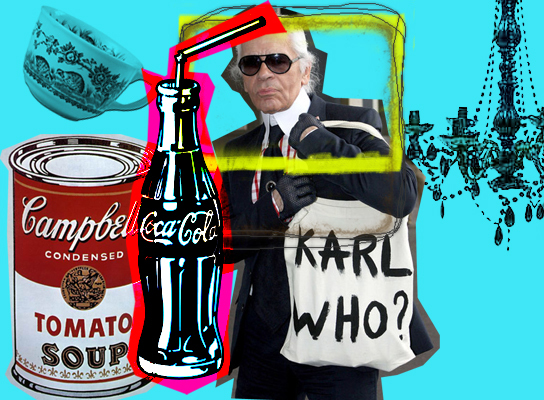 The large fashion houses work on a basis of exclusivity; not everyone can afford their original pieces. The Zara, Topshop and High Street pieces are sufficiently different enough not to upset them & function in the role of an homage to the designer. It also offers a surge of welcome publicity as magazines, blogs & the like, highlight the similarities offering features such as “skinted or minted” etc. the affordable vs the designer. Another difference I hope, lies in the quality of the designer pieces. Colin McDowell has mused on the importance of tailoring & fit this week. The High Street pieces are made to be seasonal, throw away almost; following & embracing the trend momentarily. I finish the post asking where is the line drawn? 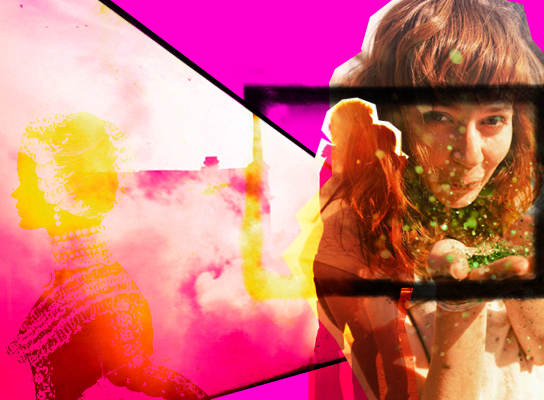 When does influence turn into copying, inspiration into a complete rip-off? Who knows? All I know is my initial irritation has subsided. There is nothing I can do to stop others imitating my work. All I can do is try to maintain my integrity and keep blogging in my own erratic style! So today this little here blog celebrates turning 3! I wouldn’t have thought it would still be here, especially looking back at my very humble first post. Who knows what the future will hold. I just hope to keep posting and keep you entertained. I’m not good at birthday posts; I promised on Twitter it would be sufficiently naff! 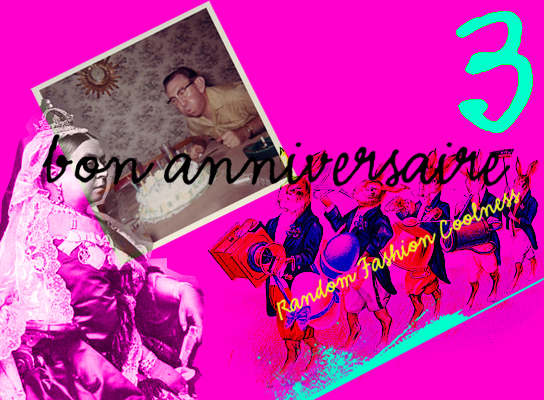 So all that remains to say is, bon anniversaire à Random Fashion Coolness! I can gauge when my style has taken a definitive line by the actions and reactions of my beautiful grandmother. She went off on a coach-jaunt with her O.A.P. groupies before Christmas and came back with a rainbow fan of tights for me. This gave me great happiness and told me two things. 1. My Gran in her 90th year was still as alert and crazy as she has always been in the other 89 and 2. I was obviously wearing A LOT of coloured tights, so much so that she had noticed. Tights have definitely seen a huge resurgence in the last few years. 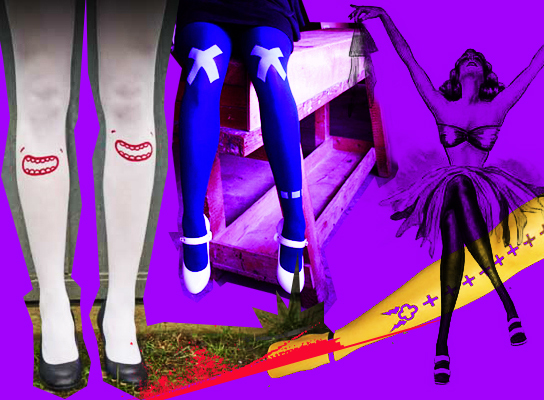 Henry Holland’s collaboration with Pretty Polly has been a triumph, Topshop‘s immense, towering wall of coloured hosiery is physical evidence of the enduring trend. My Gran’s sweet gift sent me on a mission to see what else, tights wise, was on offer. Les Queues de Sardines jumped out at me (well, at Things of Random Coolness who then told me!) They’re kitsch, they’re original but most importantly they are fun. The reason I decided to write this post today coincides with the beginning of the Awards ceremony circuit in the U.S. The Golden Globes last night showed glamour, elegance but very little fun. 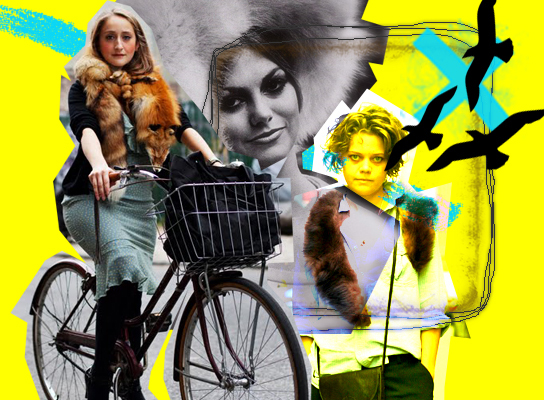 For me personally, fashion should be fun, a little quirky and different. In the face of conservatism of the Globes, the Queues de Sardines tights just seemed beautifully juxtaposed with the safer, perfectionism of the gowns. I have one concern with “higher” end tights. I am clumsy and these move into the €50 realm. I will inevitably ladder or rip them within at least 5 minutes of wearing, so there’s potential for extreme disappointment – I’d have to work the ripped imperfections! My words will not speak as much about these beauties as the pictures; browse the website here and see if you can spot some that would be perfect for you. Go ahead, have some fun and give your Granma something to talk about. Candyfloss pink – it is everywhere. LOTS of my peers have mused on the importance of hair colour this month. Foxyman blogged on the joy of embracing the true hues of colour while Discotheque Confusion extolled the virtues of burnt orange. I however have been overcome by the power of candyfloss pink. Most people were seduced by the candy-coloured beauty of Dree Hemingway’s locks on seeing her image on Altamira during the spring/summer Fashion Weeks. I remember the flurry of tweets and posts that surfaced at the time. I don’t usually like to rehash what others have extensively covered before but I also made an agreement (with myself) to post about things I love. 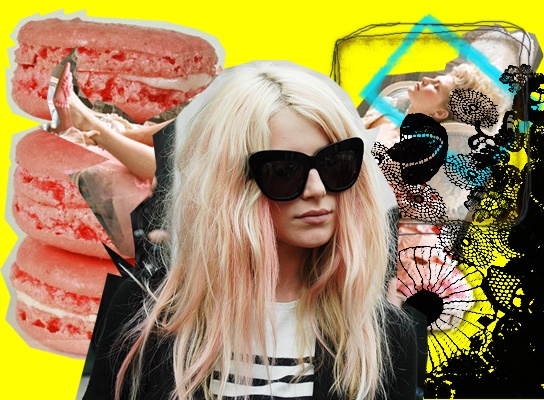 As pastels invade in the spring/summer collections my mind has been filled with candyfloss. I am not usually a lover of pink. Fuchsias and cutesy baby pinks generally upset me. I also abhor the enforced gender “colour coding” of babies. But suddenly as sheer pastels become more ubiquitous I am slowly softening to their charm. I would adore to do a “Dree” and candy-up my blondness but instead I think a change in wardrobe direction may be inevitable. A question I often ask myself is, would I start blogging if I only became aware of its existence today? When I began 3 years ago, blogging was still in its infancy but nonetheless popular; now it’s huge. I have a friend who was desperate to start a blog a few months back. I dared to ask, “Why? What message do you want to get across, what do you want to say or illustrate?” The answer was, “I just want to blog, everyone’s doing it.” It made me feel a little sad and almost devalued what I love to do. So it led me to search and poke my nose around a little to see what’s out there that’s new. There is a fair proportion of horrendous stuff – random streams of incoherent thought but I suppose therein lies the joy of a blog; it can be whatever the blogger wants it to be. It doesn’t have to be directed or dictated by an editor or advertisers etc. I eventually stumbled upon or was recommended a few new (well new to me) blogs that I thought I would share with you. The first is Jump! the tag-line is, “When you ask a person to jump, his attention is mostly directed toward the act of jumping and the mask falls so that the real person appears.” The blog is a collection of people doing just that, jumping and seemingly dropping their guard at the same time. Watching people lose their inhibitions in such an unadulterated manner means you can’t help but muster a smile; each shot seemingly filled with happiness. The Annotated Weekender – doodling all over The Guardian’s Weekend magazine. The name says it all. An illustrator scribbles all over The Guardian’s supplement. It sounds simple but it works and the hilariously witty comments made, make it all the more fun. Draw Serge!– An illustrative tribute to the late, great Gainsbourg. A beautiful little blog. I know I have mentioned this before but I feel it’s worthy of a second promotion. Jonathan Edwards “curates” this little collection of sketches of Serge. I couldn’t write this post without mentioning the musings of Colin McDowell. His offering is intelligent blogging at its best. He writes so eloquently and coherently that I often feel I am not worthy enough to comment. It is a MUST read for anyone even remotely interested in the industry. The comments his post elicits are often worth their weight in gold too. What all these blogs have in common is they fill a gap in the market. They offer something quirky or fresh that the blogging industry hasn’t yet seen or isn’t yet saturated with. Many bloggers repeat what’s already been posted, rehash others’ ideas but this originality is a breath of fresh air and a welcome break from the norm. A fellow blogger (who knows who she is) recently cleared her blog-roll. She described the feeling in almost cathartic terms and I can easily imagine how it felt. On the note of re-hashing; if you are sat reading this and seething in anger as it was you that recommended one of the above blogs to me, please email me and I will name check your greatness! Here I have broken a rule! The work of a great photographer shouldn’t be messed with. Here, I have, for the the purpose of my little collage. Je m’excuse! The second rule of great photography, for me anyway, is that it shouldn’t be overly discussed or analysed but simply appreciated. So here I stop with the waffle. Go see Daniel’s work for yourself and make your own judgements.here. I cannot take credit for this little gem of a find. Brix Smith-Start extolled the virtues of the Felt Mistress in my little interview and implored me to take a look at her work. On my return home I did and I must say I was astounded! Felt Mistress makes plush “toys.” I place the word toys in inverted commas as it seems to trivialise her fantastic work. My person favourite is her smoking Serge Gainsbourg pictured above. Her attention to detail produces the most perfect specimens that for me rival my material heroes, The Muppets. The other reason I hesitate to use the word “toy,” is my personal desire to own one of Felt Mistress’ pieces – I feel I’m WAY too old to own a toy of my own! In my forthcoming interview with Brix, you’ll be able to hear of her fervent admiration for Felt Mistress’ work & get some sneaky insights into future collaborations. I’ll keep you posted, literally, here! I’m also hoping to visit Felt Mistress myself soon to photograph some of her amazing work and hopefully snap up a Serge! 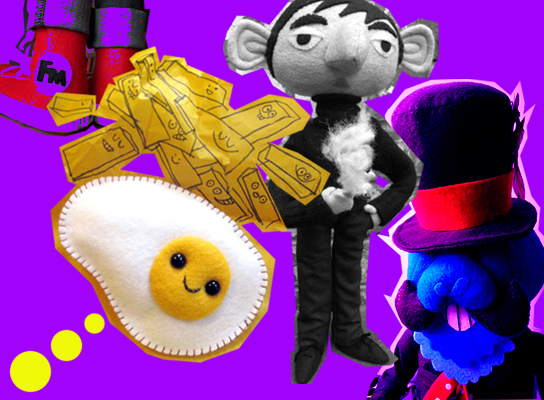 You MUST also take a look at Felt Mistress’ other half’s site, Draw Serge! 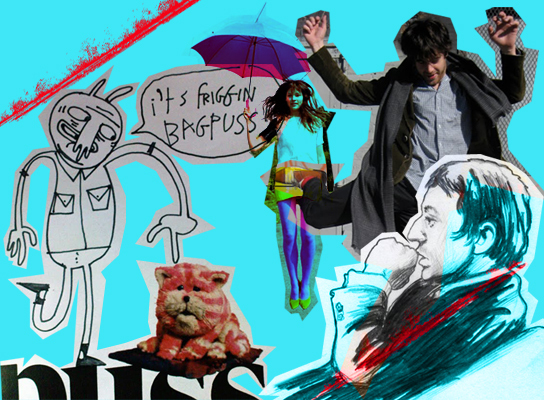 If your a Gainsbourg fan like me, this site is a must. This was another hard collage to make for me. It doesn’t truly show off the genius of Felt Mistress’ work so don’t forget to peruse her Flickr and blog for a better insight into her creations.